A lot has changed in 596 days. That goes without saying given the state of, well, pretty much everything in the world. But the professional wrestling business has rapidly changed alongside everything else, with EVOLVE at the forefront of so many of those changes. The company has furthered its relationship with WWE in that time period, even to the point where it once felt like they were an unofficial developmental territory. A new relationship was later formed with FloSlam as EVOLVE traded in its in-house options to become the featured product of the new streaming service. So much talent has come and gone in that year-plus. Johnny Gargano moved on from his role as the face of EVOLVE to a full-time position as one of the better parts of NXT with Tommaso Ciampa. Chris Hero made an unlikely return to NXT and once again took the name Kassius Ohno. Drew Gulak, TJ Perkins, Tony Nese, and Cedric Alexander joined the WWE roster as featured players on 205 Live after the Cruiserweight Classic. 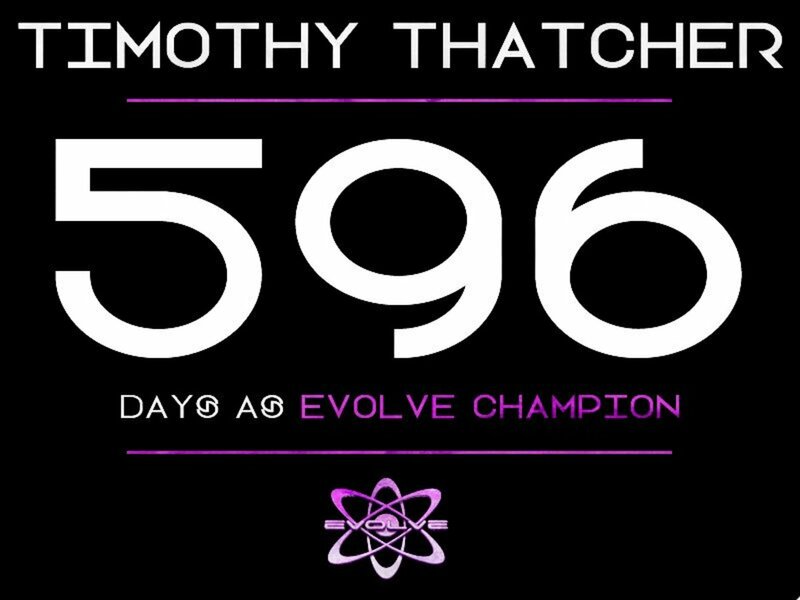 It seemed like the only thing that hadn't changed since Timothy Thatcher won the EVOLVE title on July 10th, 2015 was that he remained the promotion's champion. That ended on Saturday night at EVOLVE 79. Zack Sabre Jr. became the new EVOLVE Champion as he submitted Thatcher in front of a lively crowd at La Boom in Queens, New York. The nearly-excellent match was one of the best of Thatcher's largely lackluster reign. The audience played its part in a way that they hadn't done in most previous defenses and Thatcher himself was better in this match too. He embraced being a heel better than he ever has in EVOLVE and seemed to play to the reaction that he was getting. The crowd was desperate for the title switch, both to get the championship on Sabre and to take it from Thatcher, and they finally got it when Sabre wrapped up both of Thatcher's arms in the Octopus hold and kicked him in the head to get the submission. There may have been better moments in the past to do the championship change, but it worked well here. And the title now belongs to the person who is arguably the best worker and biggest star in the company. Sabre had been primed to take the mantle of best unsigned wrestler in the world from Hero. The torch was even passed during Hero's final independent wrestling match. Sabre didn't end up joining WWE after the CWC, but he will now be making his debut for New Japan Pro Wrestling and possibly finding a long-term home there. That schedule may keep him from becoming the new face of EVOLVE and having a reign as long as his predecessor, but there are plenty of options for the next title holder. While Thatcher attempted to continue EVOLVE tradition and hand over the championship to Sabre after prying it from a distraught Stokely Hathaway's hands, Ethan Page blindsided Sabre to set up a potential match down the road. He was ran off by ACH, who then vowed to become the next champion. Sabre delivered a brief speech to the crowd. He spoke out against discrimination and said that both the world and pro wrestling are for everyone. The locker room had come out to hear his speech, and Sabre last exchanged a look with Keith Lee as the show closed. ACH will be Sabre's first challenger at EVOLVE 80 over WrestleMania weekend in Orlando, Florida. ACH earned that opportunity by picking up a win over Jason Kincaid earlier in the night. He hit two lariats and a brainbuster before getting the pin in the opener. On the path to an inevitable championship match, Lee also continued his momentum with a victory over "Hot Sauce" Tracy Williams. Lee once again impressed, getting the win with his Ground Zero powerslam. While his victory over Sabre yesterday remains a questionable booking decision, he needed to be treated like he was nearly unstoppable after dropping his debut against Hero. And he's added a ton of credibility with wins over two of the best wrestlers in EVOLVE since. Aside from everything going on with the EVOLVE Championship, Saturday was a night of grudge matches. Matt Riddle got the advantage in his feud with Drew Galloway, though things between them remain far from over. Galloway had the upper hand on Riddle for most of the match. Riddle tried to make comebacks and finally transitioned a tombstone into an attempted Bromission. He couldn't quite lock it on, but delivered a barrage of strikes as referee DA Brewer signaled for the bell and the referee stoppage without Galloway noticeably giving up. That didn't make Galloway happy. He tried to beat down Riddle until Catch Point stopped the attack. Larry Dallas then came out to the ring, with "The Big C" Earl Cooter as his security, to attempt to create more dysfunction within Catch Point. He announced that Riddle, Williams, and Fred Yehi would all be entrants in the multi-man elimination match for the WWN Championship at the company's WrestleMania weekend Supershow. Yehi went to extend the Catch Point handshake to Riddle, but he either didn't see it or blew him off. Yehi took exception to that and called Riddle selfish because of all the times they've saved him without reciprocation. Riddle accepted Yehi's challenge to a match at some point in the future, and Williams didn't look happy with what had transpired. The other grudge match on the show was between Page and Darby Allin. It wasn't exactly a fair fight. Page put Allin in handcuffs early on and forced him to wrestle with his hands behind his back. Allin used innovative offense in an attempt to work around it. He hit headbutts, a hurricanrana, and climbed up the turnbuckles without using his hands. He even took out Page's Gatekeepers with a dropkick. But Page won with the RKEgo and a powerbomb after Allin had kicked out of a powerslam from the second rope. It was in the aftermath of that where Page stated his desire to become EVOLVE Champion. He took the mic, mockingly telling the crowd to give it up for Allin and calling him the biggest loser in EVOLVE. He then said that he was going to take the trash out of his company and stuffed Allin into a body bag. Page said that he was the only reason that people care about Allin and told him to consider his career dead as he zipped the bag and the Gatekeepers carried Allin out. There were problems between Yehi and another Catch Point teammate earlier in the show as well. Chris Dickinson prevailed in a four-way freestyle match over Yehi, Austin Theory, and Anthony Henry. Tensions between Yehi and Dickinson were more competitive than hostile, but Dickinson pinned Theory with a Border Toss as Yehi had the Koji clutch locked on Henry. The match was fun and had constant action. Priscilla Kelly again appeared at ringside after being present for Allin's match last night, though her intentions weren't clarified here either. Dickinson & Jaka remain on track to challenge Williams & Yehi for their tag titles, but Jaka wasn't as successful as his partner on Saturday. He worked with Jeff Cobb as both men tried to show their power. They no sold a series of German suplexes at one point until Cobb finally got the advantage with his strength, hitting the Tour of the Islands to win a really good match. This should end up being one of EVOLVE's best shows of the year. Every match was good, with the only minor complaint being that nothing was definitively excellent. It had the pacing that the promotion's best show's usually have. There were constant good matches for over two hours. The crowd and building in Queens also seem to enhance every EVOLVE show that is held there. Thatcher losing the championship will make this a memorable show. His reign received justifiable criticism and went on for far too long, but the crowd was desperate for the title switch on Saturday and gave it the reaction it deserved. EVOLVE will be back on March 30th in Orlando. Most of what WWN puts out during WrestleMania weekend is usually a highlight of one of the busiest periods for wrestling and this year should be no different.